Innovating Minds: Positively Smarter Launches in the U.S. In developing this book, Donna and I drew our research from a broad range of fields in order to maximize the positive impact of a synergistic approach. The book, published by Wiley, explores research on the big ideas that can have a positive influence on—and even transform—our lives by focusing on practical learning strategies. 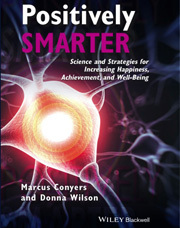 The text provides the science, structures, and strategies for creating a more effective system, so that learners are equipped to achieve goals and realize more of their unique potential across the learning life span. Research suggests that we have the power to lead happier, healthier, and more productive lives when we harness the incredible plasticity of our human brains. With practical steps supported by scientific evidence, Positively Smarter puts improved cognitive function—leading to greater success—in your hands.